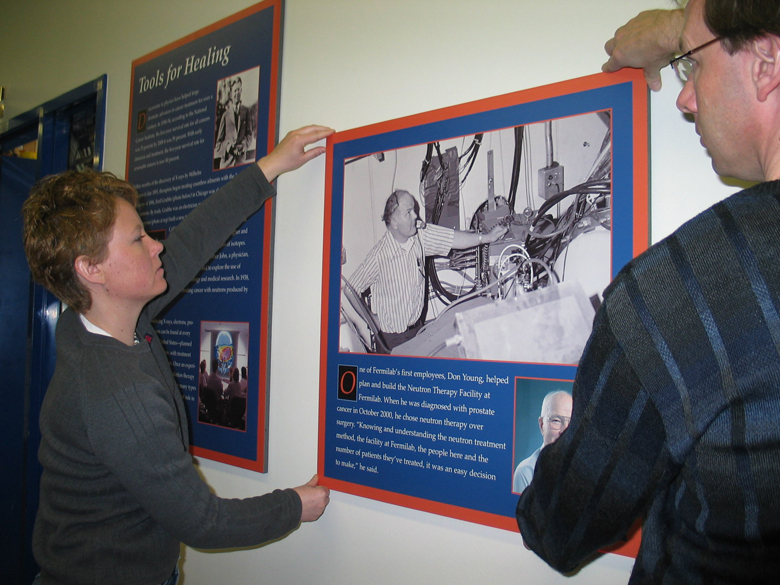 Next time you take visitors for a tour of the Linac Gallery, new posters will help you explain what neutron therapy is and how it helps fight cancer. Designed by Diana Canzone and Cindy Arnold of the Fermilab Visual Media Services department, the eight posters highlight the historical use of accelerators in fighting cancer; the construction of the Neutron Therapy Facility at Fermilab 30 years ago; and the state-of-the-art treatment available today. The Institute for Neutron Therapy, operated by Northern Illinois University Institute, is equipped to perform vertical CT scans and develops computerized treatment plans for its patients. 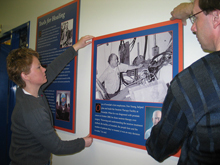 The posters, printed in house, feature large photos to accommodate the numerous group tours that walk through the Linac Gallery. The blue-and-orange color scheme of the posters--taken from the Pulse exhibit that was on display in the Wilson Hall atrium in 2002--reflects two of the traditional Fermilab colors, basis of the Fermilab Graphic Design Standards. Four representatives of the French Atomic Energy Commission (Commissariat a l'Energie Atomique) visited Fermilab last Friday. Dr. Yves Caristan, Physical Sciences Director, Dr. Gabriele Fioni, Dr. Doris Neumann-Maazi and Dr. Bernard Salanon enjoyed a tour of Fermilab, heard talks on the ILC program and the proton driver, and had lunch with Pier Oddone at Chez Leon. 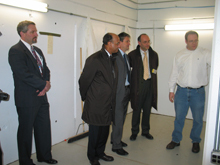 As part of the tour, physicist Timothy Koeth (photo, right) described the testing of the superconducting cavity inside capture cavity number 2 in the Meson laboratory. For decades, the big guns of American science have been the U.S. Department of Energy's particle colliders, which investigate the nature of matter by accelerating subatomic particles and smashing them together. Colliders at the Fermi National Accelerator Laboratory (Fermilab), Stanford Linear Accelerator Center (SLAC) and Brookhaven National Laboratory have discovered exotic particles such as the top quark and revealed phenomena that hint at new laws of physics. But this great American enterprise, like so many others, is now moving overseas. While the Europeans and Japanese build new particle accelerators, the U.S. is poised to shut down its premier colliders at Fermilab and SLAC over the next few years. And funding for Brookhaven's Relativistic Heavy Ion Collider (RHIC) is so tight that the lab could not have run its full slate of experiments this year without $13 million raised by a New York billionaire. The sad story began in 1993, when Congress canceled the $11-billion Superconducting Super Collider, the intended successor to Fermilab's Tevatron. CERN, the European laboratory for particle physics near Geneva, then started work on the Large Hadron Collider (LHC), which would produce impacts with energies seven times higher than the Tevatron's. Because the greater energies could enable researchers to discover hypothesized particles such as the Higgs boson, American physicists flocked to the LHC, which is expected to begin operating next year. that are applied to Fermilab and the weight that these measures carry beyond our laboratory. For example, some of these measures are used for the evaluation of the DOE High Energy Physics Office itself. In counterpoint to these quantitative measures we receive detailed reviews by the Department of Energy on particular aspects of the laboratory that go beyond the numbers. In these reviews we hear judgments and advice by expert panels on various technical and operational issues. These reviews give us valuable feedback and a check on how we are managing projects and operations. 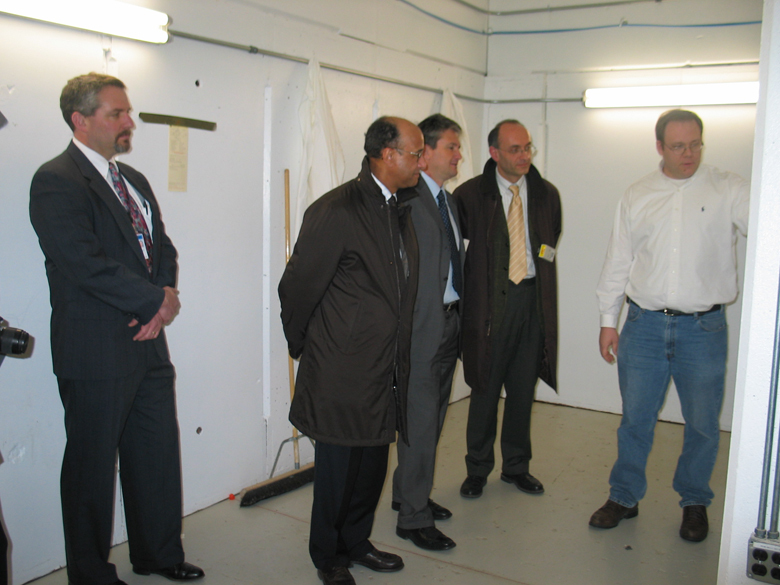 Last week a DOE Review Committee reviewed the Tevatron Operations. The Tevatron Operations Review Committee was led by Daniel Lehman, a legendary figure in the world of project reviews, and included a distinguished set of accelerator and management experts. While recognizing that much remains to be done to fully achieve our integrated luminosity goals, the committee was extremely positive about the progress over the last year. Members were complimentary and impressed with our greater understanding of the Tevatron lattice that allows the exploration of better operating points. It also recognized the aggressive remediation that we have taken to stamp damaging quenches. The electron-cooling of antiprotons was considered a huge success. The committee recognized the many studies completed over the last year, the improved anti-proton stacking rate, the improvement in the emittance of the booster that allows better operation of the Main Injector and many other improvements to the overall operation of the Tevatron. Even more importantly, the committee members recognized the good management that the Accelerator Division has provided to this massive enterprise. The Tevatron has been and continues to be the focus of the laboratory and has involved many, many people across the laboratory. Each of you should feel justifiably proud of these results. - Call Dianne Engram (x4633) or Elliot McCrory (x4808). The US DOE and the Italian INFN announce the 2006 Summer Student Exchange Program, dedicated to the exchange of US and Italian students in science and engineering. Under the program, Italian students will be able to travel and do research in US labs and US students will be able to come to Italy and to do research in INFN labs and units. Now is the time to apply. There will be a Unix users meeting on Wednesday, March 29 from 1:00 to 2:30 p.m. Network experts will talk about Firewall, Security experts will demo SeanMeNow, and the Linux support group will talk about Hepix and Linux updates. Fermilab is in the process of applying to win a place as one of Chicago's Best and Brightest Companies to Work For. One of the requirements is that they survey 80 percent of our employees by e-mail. These surveys will reach employees in the next few days, so don't be suprised if you see one in your inbox.